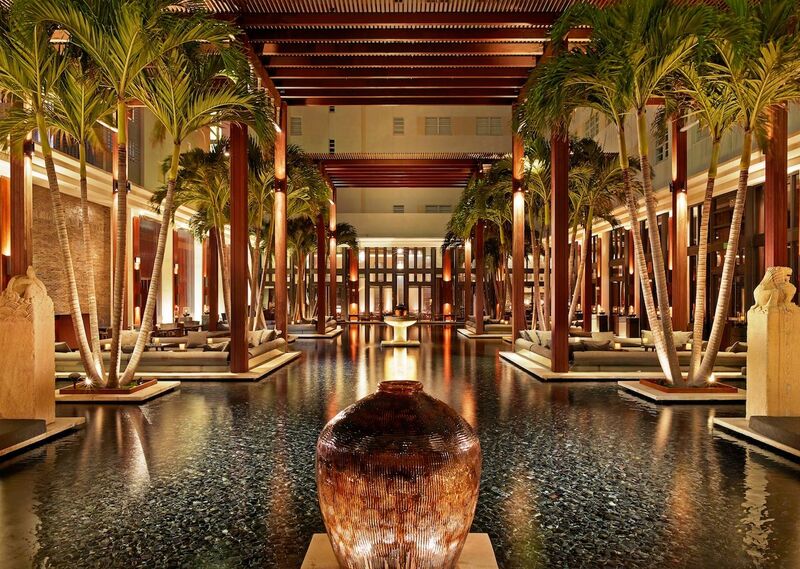 Miami has no shortage of amazing hotels. With so many people flocking to the city to see the gorgeous turquoise waters of South Beach and incredible street art in Wynwood every year, hotels have to compete with each other by offering first-class restaurants, glittering pools, and as many extra amenities as possible. While there are too many great places to name, some stand out above the rest. 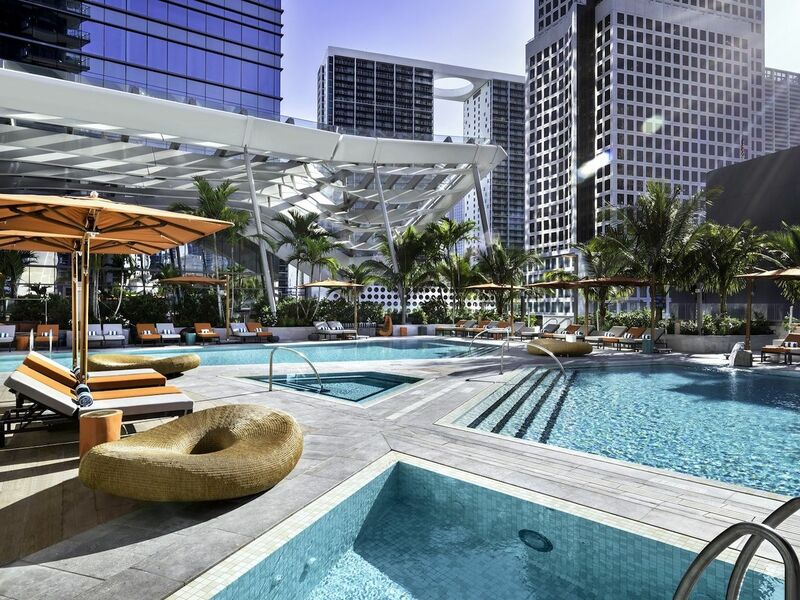 If you’re overwhelmed by the sheer number of accommodation options in Miami, make things easy for yourself by booking a guaranteed fantastic stay at one of these six hotels the next time you’re in town. Kimpton always knows exactly what we want in a hotel stay. A chic design and cool vibe are present in all of their properties, as are stellar dining options and excellent service. So when Kimpton Angler’s opened in South Beach earlier this year, we had to check it out. The main building, which includes 85 guest rooms with terraces or balconies, is finally open and home to the front desk and Minnow Bar. Its new addition is set to open soon and will include 40-some more rooms, some of which are two-story lofts and three-story bungalows. The new building will also house the restaurant Seawell Fish N’ Oyster and a courtyard with an adult-only pool. The standard guest rooms are everything we’ve come to expect from Kimpton. The bohemian nautical decor is bright and airy with bamboo floors, marble bathrooms, and a well-stocked mini bar, which includes pre-batched cocktails for your drinking pleasure. Fitness-minded travelers can partake in the property’s daily HIIT classes at no extra charge or visit the gym. There’s also a yoga mat stashed in every room and a 24-hour yoga channel on TV, so you can practice your downward dog at any time. The serene rooftop pool is a fab place to catch some rays with a tasty cocktail in hand. While the restaurant isn’t open yet, Minnow Bar’s cocktail menu will quench your thirst with wonderful libations from bar director Chris Resnick. There’s also a killer breakfast spread available for purchase daily, which we recommend enjoying on the adjoining tiled terrace. While all of these things make Kimpton Angler’s a wonderful place to stay, the Angler’s Reef program is what makes it truly special. The hotel has teamed with the University of Miami’s Benthic Ecology and Coral Restoration Lab to adopt a coral reef off the shores of Miami Beach. Guests who want to learn more about this precious ocean resource and embark on a great adventure can enjoy a half-day Rescue-a-Reef excursion in partnership with local group Deco Divers. It’s a great way to get your fix of glorious nature while helping a worthy cause in the process. There’s a good reason why we keep coming back to the Nautilus, a SIXTY Hotel year after year. Between the friendly service, chic design, comfy guest rooms, and stunning private beach, it’s one of our absolute favorite places to be when visiting South Beach. The property was originally designed in the 1950s by architect Morris Lapidus who was known for his neo-baroque “Miami Modern” aesthetic that is still so prominent in the city today. When the hotel was renovated and reopened in 2015, the team was careful to keep much of its original charm intact, which is apparent the moment you step foot in the lobby. The room has a circular shape and is designed with tall white columns, plush velvet furniture, and a sunken bar where you can enjoy classic cocktails and a killer daily happy hour from 5:00 to 7:00 PM. There are a ton of different room options depending on your needs. A classic king or double queen room is perfectly comfortable, but you can always spring for a balcony or studio room (which features a large sitting area and second TV) if you prefer more space. Every room is appointed with custom-made Sferra linens, Maison Margiela bath products, espresso machines, and vintage travel chests stocked with the best minibar loot we’ve seen. The Nautilus Cabana Club is a beautiful outdoor-indoor restaurant that also fuels the fare served poolside and for room service. We love grabbing breakfast at Nauti Grind, the lobby coffee stand that serves fresh fruit, juice, Zak the Baker pastries, and delicious empanadas (try the chicken or spinach). You can’t visit Nautilus without spending time at its beautiful saltwater pool, which is flanked on the east by a circular bar and lawn studded with hammocks and wicker furniture. Walk through the bamboo grove to the private beach and settle into a chaise lounge to enjoy views of the turquoise Atlantic. Party people will love the rosé Sunday brunch, complete with a live Cuban band, and adventurous spirits should grab a complimentary house bike and explore the surroundings. The Setai is a vision of luxury and elegance. The hotel was built in 1937 and opened as the Dempsey-Vanderbilt hotel, and it’s still an Art Deco vision — particularly how the movement was interpreted in Asia — 80 years later. The richly appointed rooms are refined and spacious. A Studio Suite, which is the smallest of the lot, is still designed with a large sitting area where you can have friends up for a cocktail or eat breakfast with a view of the Collins Avenue or The Setai’s tranquil courtyard. If you’re traveling with a group, the ocean suites offer a view of the glistening Atlantic and are available with one, two, or three bedrooms. High rollers can spring for the four-bedroom penthouse, which is lavishly designed with four-and-a-half bathrooms and a private rooftop terrace with infinity pool. Three gorgeous infinity swimming pools are surrounded by towering palms and kept at different temperatures to suit your individual needs. Take a walk down to the beach and lounge in the sun, or adventure out on the water on one of The Setai’s house jet skis. The hotel’s concierge is one of the best in the city and can arrange a variety of awesome activities, whether you want to check out Miami’s performing arts scene, go on a museum tour, or plan a day of water sports like parasailing or snorkeling. You can even have a beach picnic packed for you and ride down to the sand on one of the hotel’s custom Republic bicycles. Even if you’re not staying at The Setai, you have to stop in for dinner. Jaya serves pan Asian cuisine from chef Vijayudu Veena, and the restaurant is set in the most gorgeous room in Miami. It’s designed with bright lanterns hanging over a reflecting pool and has a retractable roof so you can enjoy it rain or shine. Don’t miss the short rib gyoza; chicken tikka, which is served on a small charcoal grill; and side of vegetable fried rice with duck. Go for Friday dinner during Jaya’s Asian Night Bazaar where your meal will be accompanied by live contortionists and fire dancers. 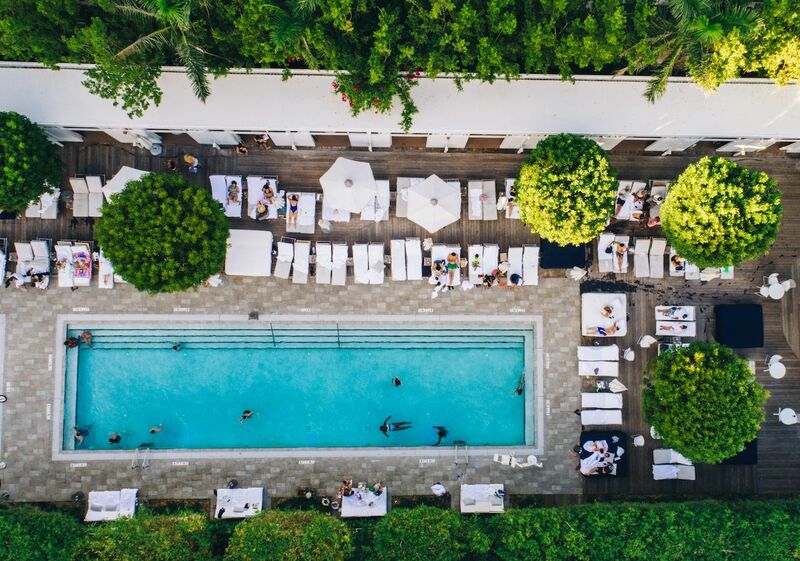 If you’re looking for chic, whimsical, and fun rolled into one, Mondrian South Beach is our favorite place to get it all. Designed by Marcel Wanders, the visionary style pays homage to Sleeping Beauty’s castle. 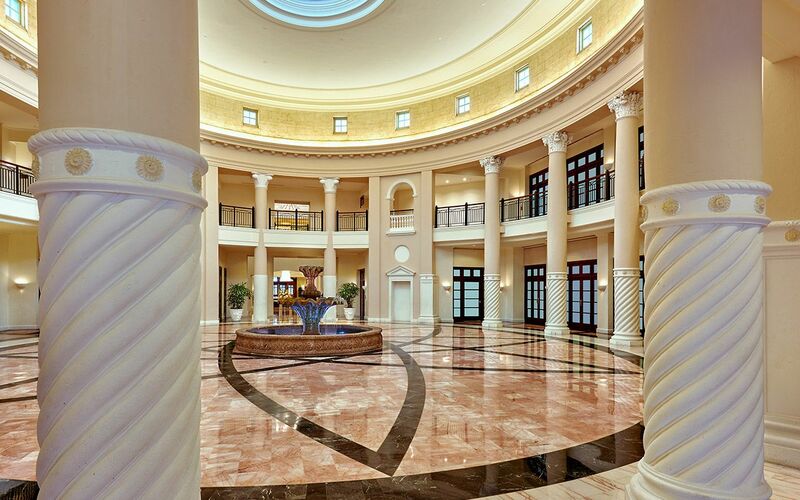 Pulling up to the lobby indeed feels like a fantasy. There are chandeliers encased with oversized bells, a floating staircase, and whitewashed furniture that’s a mix of mod and neo-baroque. Mondrian South Beach sits on Biscayne Bay, so a bay-view studio is worth the splurge when you stay here. We’re fans of the deluxe room, which includes a spacious kitchen area with a small fridge, two-burner stove, and dining table. The rooms are big and filled with light and include details like trompe l’oeil mirrors and Dutch Delft tiles printed with modern Miami designs. The balcony is the best part of the room experience; not only does it overlook the bay, but it also sits above the hotel’s stunning half moon pool. Because the pool sits behind the hotel on the bay, it gets sun later in the day rather than early in the morning. This means that the music is playing well into dinner time, and people are reveling in a cocktail hour libation either on their balconies or on chaise lounges down below. 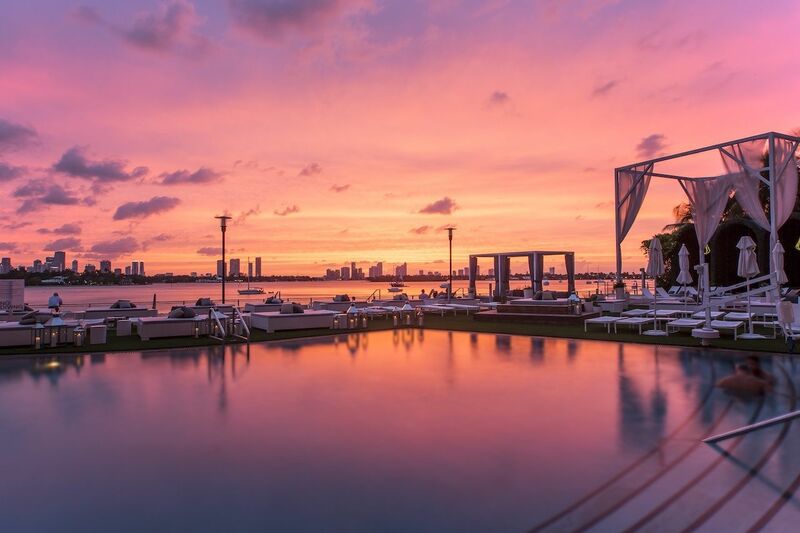 It’s no wonder the poolside bar got the nickname “Sunset Bar” — it offers the best view of a fiery Miami sky in the city. During the day, the pool’s daybeds, hammocks, and astro-turf-covered cabanas are perfect for those who want to laze in the sun. But anyone up for adventure can enjoy a variety of water sports on Biscayne Bay, including paddle boarding, jet skiing, kayaking, and boating. Mondrian Caffè serves globally inspired cuisine for breakfast, lunch, and dinner, and it offers a sumptuous Sunday brunch with everything from hand-rolled sushi to charcuterie to an omelet station. On-site GUYandGIRL spa offers the usual massages and body treatments, but it also has a Wednesday happy hour special where you can snag a blowout or express facial for only $40. The Mondrian gym is well-equipped, and it even has a menu of complimentary weekend wellness classes. If you’re not concerned about staying right on the sand, Mondrian South Beach will become your new favorite hotel. If you’d rather stay away from the hustle and bustle of South Beach, look no further than charming Coral Gables, a colorful neighborhood where you’ll find vintage street trolleys and Mediterranean Revival architecture. The building that houses the Hotel Colonnade was built in 1926 and has been home to a variety of businesses, included a pilot training facility, movie studio, and even a WWII-era parachute factory. Its historic spendor is still intact, but it has all of the modern amenities to make you feel comfy away from home. We love the elegantly modern Ponce De Leon rooms, which feature a sizeable sitting area and workspace in addition to an elegant stainless steel four poster bed. Big marble bathrooms boast C.O. Bigelow bath products and cozy robes, perfect for taking a coffee on the balcony on lazy mornings. A 24-hour fitness center has everything you need to stay fit on the go. We paid a visit to the tranquil outdoor heated pool, which is situated on a large terrace with a small bar. For those who like their cocktails to come with an activity, the game room is a fun place to visit and features things like foosball and pool to keep you busy. Best yet, all of the on-site dining is excellent. Visit Crema first thing in the morning for coffee, yogurt parfaits, and breakfast sandwiches or dine at House for an unbelievably tasty challah French toast. Coral Gables offers complimentary trolley service Monday through Friday, which makes Hotel Colonnade a convenient place to stay for taking in Miami’s beauty and history without the crowds. We love staying steps from the beach when visiting Miami, but it wouldn’t be a trip to Magic City without exploring the burgeoning neighborhoods on the west side of Biscayne Bay. If the downtown vibe is more your scene, then EAST, Miami in bustling Brickell is a hot spot you don’t want to miss. There’s a ton of great restaurants, bars, and shopping in Brickell, but artsy Wynwood and the Design District are also nearby, so you can get a taste of it all. 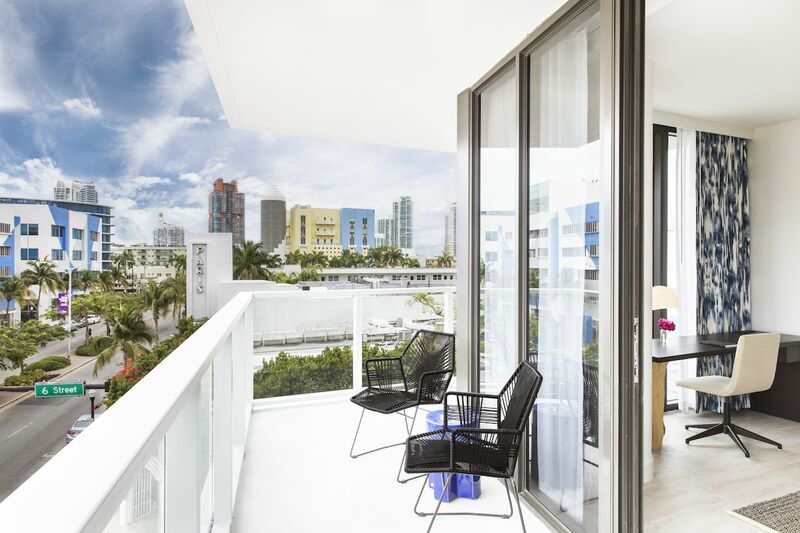 The rooms at EAST, Miami are sleek and minimal, and they all feature a balcony, no matter the size. They’re tech savvy, too, so you can stream your content through the smart TV and play your music with the Native Union Switch device. EAST, Miami is home to some of the best restaurants on this list. Quinto La Huella, which is the Miami outpost of Uruguayan beachfront restaurant Parador La Huella, specializes in wood fire cooking and sushi — think octopus carpaccio and a perfectly seasoned New Zealand rack of lamb. Sugar, the gorgeous rooftop bar and garden, serves cocktails and Asian tapas. The lobby bar and Cafe Domain is open all day, so you can grab breakfast and coffee, light snacks, and cocktails whenever you desire. The stunning pool deck is adorned in orange and turquoise and features four different pools (lap pool, spa pool, cold plunge and hot tub) to cool off in while catching some rays. EAST, Miami takes fitness seriously, so you’re in good hands if you need a daily sweat on vacation. The gym BEAST (aka Body by East) is equipped with everything you need for every workout, from cardio to weight training to yoga. You can even bring your personal trainer or ask the guest experience team to book a local fitness pro to work with you.